Recently we wrote about the Kickstarter project Pixelstick, an advanced LED wand that can reproduce programmed images in the air. While this is a very exciting project, it also left us with some questions about the product. 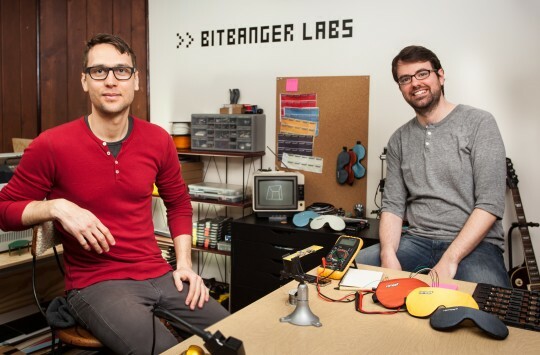 Luckily Bitbanger Labs, the NY-based brains behind the product, were willing to reply to some of our queries. Read here what they had to say. How did you come up with the inspiration to make such a product? We’ve both been avid lightpainters for a while but we’re always looking for ways to leverage our tech backgrounds into making things geared towards our hobbies. We saw an opportunity to make something really cool that we ourselves wanted to use, and it wasn’t long before we realized pixelstick was something the world would want to see. In the Kickstarter you mentioned a bulb function. Does the Pixelstick has the function to trigger a bulb camera? Pixelstick is compatible with remote minijack triggers – the same remote can be used to fire both the camera and the Pixelstick. Light painting is easy to try, but difficult to master. What would you say to people who have little to no experience? Most people’s first lightpainting is something extremely simple, like trying to write their name with a flashlight. Equipped with pixelstick, someone’s first lightpainting can be a full color ribbon they’ve waved themselves, their name written in the font of their choice, a picture of ALF, or anything else they can dream up and scale to 198 pixels high by X pixels long. Not all people move at the same rate while holding the pixelstick, how do you maintain sqaure pixels? The speed of pixelstick is customizable as well, not constant – roughly steady walking speed produces great results for most people, and if not, both pixelstick speed and walking speed can be adjusted to match. Also, steady speed isn’t always even desirable – check out some of our ribbons! Those were twirled and waved and slowed and sped up in order to capture a compelling, organic image. We definitely mounted Pixelstick to a wheel to get some of the longer animations (the rear channel of Pixelstick makes it easy to mount to things with standard size stuff) but the majority was captured by simply walking it through! It’s surprisingly easy to walk straight and steady with it, if that’s what is required for the image. It’s light and well balanced. For more information or to acquire a Pixelstick for yourself, please visit their Kickstarter. Do you have any other questions for Bitbanger Labs? Let us know in the comments!